Wow how did this week go by so fast?! I've been so busy I almost forgot to post one of my new favorite recipes. We are in full graduation party mode around here - only one week until our baby girl graduates from high school!! I'm not quite freaking out yet, but I'm sure the tears will be flowing next Saturday morning! Until then let's talk about blueberries and cornbread. Not a likely combination, but oh so good. I first tried it at Whole Foods a couple of months ago and thought it was quite tasty, but I knew a homemade version would be so much better and I was right. It was the perfect side to go along with my lunch time salad several times last week. Coat an 8 inch bake dish with cooking spray or butter. In a bowl, beat eggs, buttermilk and butter to blend. In another bowl, mix flours, cornmeal, sugar, baking powder and salt. Stir flour mixture into egg mixture just until evenly moistened. Gently fold in berries. Pour mixture into a greased 8 inch bake dish. Bake at 375 degrees for 20-25 minutes until done. Cool on a wire rack for 10-15 minutes, then cut into squares. Follow Me and My Pink Mixer on Facebook too! 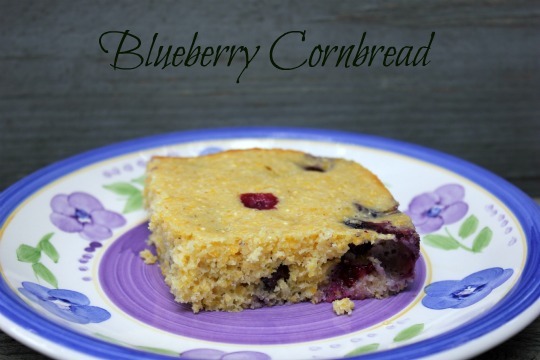 This is a different cornbread than I've had, but it sounds delicious! Enjoy the graduation and enjoy every moment you can with your daughter. You'll cry, but the next stage of life is good too! My dauther got married last year so now we are empty nesters. It did take some getting used to, but it is good.